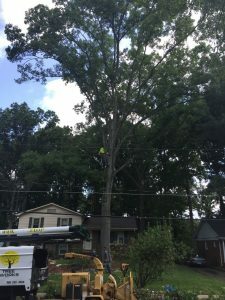 Tree elevation and canopy lifting is not the kind of service that can be performed by just anyone. This takes professional equipment and experience, both of which are at your service when you choose to go with Tree Works. If you are unsure as to whether or not this service is right for you, here is some helpful insight into the process. A canopy can be lifted by completely removing limbs that are low-hanging and drooping towards the ground. This can provide a fuller look to the top of your tree, which is often more appealing to the eye. This is also more functional when the area below the tree is used for recreational purposes. Slightly pruning the tree’s parent stems will result in a lighter weight on those large branches. The area that is trimmed is mostly the tips of branches, which ensures that a tree will maintain its healthy growth. Substantial cuts into a tree are avoided in order to maintain the biological function of the tree. The combination of tree elevation and canopy lifting will create a safer environment for everyone who ever steps foot outside of your home. The hazards outside of your home will be reduced and you won’t have to worry about a violent storm bringing branches down on your homes. This service will also make for healthier trees. Lifting your canopy will give your exterior a completely new look. The professionals at Tree Works are ready to make this happen with our affordable Tree Elevation/Canopy Lifting services in Charlotte, NC.